The discovery of a decade-old copy of a state registration inside this Commander 27’s disastrous interior helped the author in his title application during the boat’s restoration. 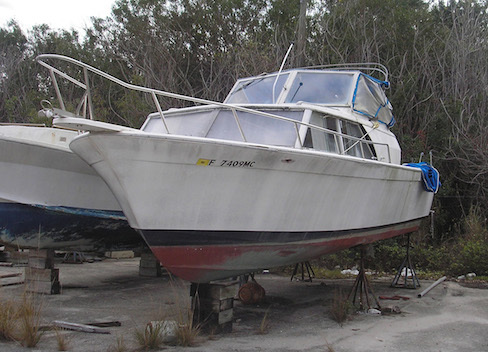 Obtaining ownership for an abandoned boat varies from state to state. It also varies with the types of existing documentation available, so getting title for a U.S. Coast Guard–documented vessel is different from that for a state-registered vessel. Any outstanding liens against a title also complicate the process. That being said, I hope the five-step guidelines in the following example of procuring a title for the 1965 Chris-Craft Commander 27 we restored in Florida will help others (see “Back From Abandoned” in Professional BoatBuilder No. 156 and Delivering the Commander 27). To begin, I searched the boat for identification/documentation. In 1972, boat manufacturers began assigning a HIN (hull identification number) to all vessels. This 12-character serial number is the equivalent of the automotive industry’s VIN (vehicle identification number). The HIN is usually imprinted on the transom in the upper-right-hand corner. The number is placed in the female mold for a fiberglass hull, and each hull has a unique number. Vessels manufactured prior to 1972 may have a manufacturer’s identification number elsewhere in the hull … or not. In cases where no identification numbers are found, a state agency is called upon to inspect the vessel. In Florida that used to be the county sheriff’s department; now it’s the Florida Fish and Wildlife Conservation Commission (FWC). State registration numbers must be displayed on both sides of a vessel’s bow, with a new state ID decal added after the numbers on the port side every year. Either the letter(s) will be opened, possibly answered, and a signed receipt will be returned to the sender, or they will be returned unopened to the sender with no response and, typically, no known forwarding address. All three unanswered letters or signed and returned certified mail receipts must be saved. Assuming the fees are not paid, the yard proceeds to the next step. The three letters we sent were returned unopened and refused. Two identical advertisements must then be placed in consecutive issues of a local newspaper. The ads must include the vessel’s year, make, model, HIN, and registration numbers, and the time, date, and location of the auction. “Proof of publication” for both ads must be documented, including a receipt from the newspaper and a copy of the paper showing the ad. These two documents must be notarized. The auction is held on the date specified. The owner, or anyone responding to the newspaper ad, has the option of appearing at the auction and making a bid on the boat. The winner of the auction must then proceed to the next step. Usually, no one shows up except the boatyard representative and, in rare instances, a client of the yard who wishes to buy the boat. In the latter case, a price is agreed upon, and this money is paid to the yard. The three certified letters or return receipts and the two notarized newspaper ads are then taken to the local Department of Motor Vehicles (DMV), and an application for title is filled out by the boatyard representative whose name is on the certified letters (and possibly a client who has purchased the boat). In Florida, a specific person or persons perform this duty, and the boatyard is pretty much at their mercy as to whether they process the application in a timely manner. This can take anywhere from a few weeks to a few months. The application goes to the state, which then awards a new title in the name of the boatyard representative or his/her client. If a client purchased the boat, he/she must present a bill of sale and pay sales tax on the purchase. In the case of the Commander 27, I went to the DMV with the owner of Riverside Marina I work with, and we applied for a title in the name of my New York friend and client. The sum paid for the boat was $1,000. Read “Back From Abandoned” by Reuel Parker in Professional BoatBuilder No. 156; the magazine is free for qualifying members of the marine industry. Subscribe here.